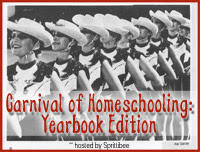 Carnival of Homeschooling is hosted at Sprittibee's. this one is the "yearbook edition"... beautifully done. Just go read this very interesting story at Ragamuffin Studies blog: Taming the speed demon. Up for some challenge in math? Try contests! Could a nice math contest spark up some interest and motivation in your student(s)? I really like the idea of math contests and problems of the week. When my kids get a little older, I'll probably use some problem of the week contest from the Internet. Typically with problem of the week contests you simply do the problems at home and send the solution over the Internet. You, as the teacher, can be in control of time and additional resources used. The contest problems are more challenging than standard textbook problems. They "stretch their brain", perhaps even strech mom's brain! But that's all for good. We must not let our students live under the impression that all word problems are solved by the method just studied in the lesson. I've written about the need for challenging and open-ended problems before. You might want to check those posts out as well. I haven't blogged for a while but I've been thinking about this topic for a little while now. It is your multiplication algorithm, also called long multiplication, or multiplying in columns. I also happen to be writing a lesson about it for my upcoming LightBlue series 4th grade book. The standard multiplication algorithm is not awfully difficult to learn. Yet, some books advocate using so-called lattice multiplication instead. I assume it is because the standard method is perceived as being more difficult. But let's look at it in detail. To multiply 7 × 84, break 84 into 80 and 4 (its tens and ones). Then multiply those parts separately, and lastly add. So we calculate the partial products first: 7 × 80 = 560 and 7 × 4 = 28. Then we add them: 560 + 28 = 588. I want to point out to you a post by Denise at Let's Play Math. She has a quiz concerning fraction rules: can you explain to your children why this way or why that way, as concerning fractions? If you need a common denominator to add or subtract fractions, why don’t you need a common denominator when you multiply? Maybe you can explain why, maybe you can't. But don't worry. She's going to continue the topic and explain all of these, on her blog. Don't miss that. Background: my daughter has been learning about 3-digit numbers and she's pretty confident with numbers that have hundreds now. She's also heard us adults mention some bigger numbers. "Hundred, thousand, million, googol, and gamazon." It's a new number she made up, which "comes after googol and nine hundred ninety-nine." I guess she's learned something anyway. This story is fascinating; they found a long-lost works of Archimedes under the text of a prayer book, and used modern technology to "see" under the prayer text. After the text was recovered, it was discovered that Archimedes actually found some of the principles of calculus, and used them to figure out volumes and areas. He dealt with "actual" and "potential" infinity, which is exactly what calculus is about. And he lived thousands of years before Newton! She goes through a bunch of word problems from Singapore Math 3-A book, and explains both a solution based on algebraic thinking, and a solution with bar diagrams. It's good reading for all of us who teach, actually. I'm sure youngsters will like this card "game"! I'm going to try it with mine. I took time yesterday to make a new worksheet generator. I always enjoy building those; I like simple programming like that and the math in it. Generate free factoring worksheets - factorize numbers to their primer factors. I wrote some thoughts concerning the comparison between Math Mammoth Lightblue series and other homeschool math curricula. It's not complete, and I'd appreciate your thoughts, as well, to add to the page.